Anti-Trump protest in Portland erupts in violence. It’s been a difficult few years for America. The lines of division have been drawn sharply and the recent Presidential campaign has accentuated that division. 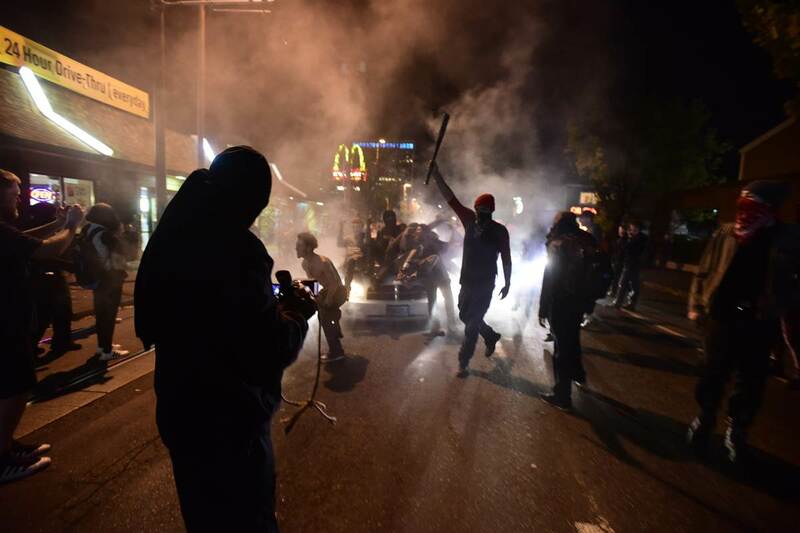 Sadly, hateful rhetoric from a bitterly fought campaign, has now spilled out into the streets of America in the form of protests and violence. We are all aware, however, that this violence is not new. The riots sparked by the shootings of black men and the deadly assault on police officers provide the terrible proof that America was already deeply divided. Does division originate from the bottom up or the top down? In other words, what is the source of division? Some maintain that it comes from divided families and communities only to explode on a national level. Others attribute it to leaders. Perhaps apathetic leaders only concerned with keeping the status quo. Or perhaps leadership that uses harsh divisive rhetoric. Interestingly, the story of King Saul in 1 Samuel addresses this question. A case can be made that division comes from the top and the bottom of society. In fact, the books of Samuel testify to this truth. When values are forsaken, families are damaged and when families are damaged, communities, and eventually the nation, is damaged. However, corrupt leadership also has a profound effect. “As goes the king, so goes the nation,” could be one way of summing up the stories contained in both Samuel and Kings. These truths were brought home to me a number of years ago as I researched and wrote a book on 1&2 Samuel entitled, Family Portraits: Character Studies in 1 and 2 Samuel. I was struck through my study that a book about leadership (i.e., kingship) was also a book about families. These two themes interact so closely in 1&2 Samuel that it is impossible to separate them. 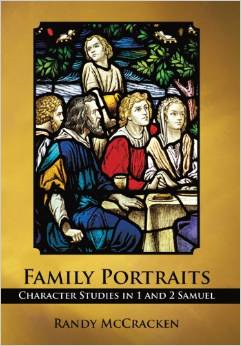 What follows is an excerpt from my book Family Portraits. This excerpt is taken from the introduction of Saul’s family (pp. 100-102). It was written long before the recent election but some of the principles in it point to lessons that are timely. What I seek to do here is provide my original words (in italics) which I will then reflect on at the end of this post in light of the recent election. Saul’s kingship further divided the people of Israel. Saul’s family is introduced in 1 Samuel 9:1 with a four-person genealogy, reminiscent of the introduction of Samuel’s family in 1 Samuel 1:1. This similarity, as well as the narrator’s glowing introduction of Saul and his family, leads the reader to expect great things. Saul’s father, Kish, is described as a “man of valor” (“a mighty man of power”—NKJV), while Saul is twice described in positive terms—“handsome” (literally, “good”) and “taller than any of the people” (9:2). If outward appearance can be trusted, then 1 Samuel 9:1–2 holds out great hope. The discerning reader, however, has learned from Eli not to jump to conclusions too quickly. While there are some storm clouds on the horizon, the story of Saul seems to get off to a good start (1 Sam. 9–11) before things go wrong (1 Sam. 13–31). Saul inspired the fierce loyalty of many, such as the Ziphites (23:19–24) and the inhabitants of Jabesh-Gilead (31:11–13). On the other hand, he could strike out violently against his own people (the priests of Nob—chap. 22), including members of his family (Jonathan, 20:30–32). As a result, even Saul’s children are torn between loyalty to their father and the “beloved” David (18:1–4, 20). Both Jonathan and Michal struggle with remaining true to their father while protecting David (19:11–17; 20:31–32). However, it must be said that Jonathan remains with his father even in death (1 Sam. 31:2); and, in spite of everything, David’s eulogy is a moving tribute of his loyalty to Saul (2 Sam. 1:19–27). Even those whom Saul pushes away are drawn to him! This tug-of-war, which results in great tensions, is an important theme in the story of Saul. Consequent divisions are not only evident in his family, but also in the nation he ruled. With the death of Saul the nation erupts in civil war (2 Sam. 3:1). A reader can find him or herself with conflicting emotions about Saul. In spite of his failings, he evokes sympathy. Saul is not so much the sort of character you “love to hate” as the kind you “hate to love.” Interestingly, commentators are as divided over Saul as his own nation was. Some see him as a victim of a predetermined fate, while others see him as a man whose disobedience cost him a kingdom. Saul remains a divisive character to this day! Any treatment of his family must therefore reflect this truth. Saul’s ability to polarize not only extends to Jonathan, Michal and David; division follows his family even after his death. Abner and Ish-bosheth become alienated from one another (2 Sam. 3:6–11), as do Mephibosheth and Ziba (2 Sam. 19:24–27). Another descendant of Saul, Shimei, is a vocal supporter of the division caused by Absalom’s civil war (2 Sam. 16:5–13). Jesus said, “every…house divided against itself will not stand” (Matt. 12:25). This truth is part of the reason that the house of Saul deteriorates from strength (1 Sam. 9:1) to weakness (2 Sam. 3:1). The main reason, however, is Saul’s failure to honor the Lord. Along with David, Saul and his family dominate the narrative of 1 Samuel chapters 9–31. David and his family are the main focus of 2 Samuel, yet Saul’s family continues to play an important role. Although a lot of material is devoted to the reign of Saul, we learn of God’s rejection of his kingship and dynasty rather quickly (1 Sam. 13:14; 15:28). This means that a major portion of the story focuses on how Saul and his family deal with this rejection, and how they treat his future replacement. This theme raises an important question that everyone must confront at sometime. How should we respond when someone is chosen or favored over us, especially when that person ends up in the position we once occupied? In Saul’s case it is not simply a matter of David being favored over him, but one in which he disqualified himself through sin. The narrative teaches us that a response of pride, envy, and a refusal to repent, leads to a dead end for Saul—quite literally! This kind of attitude can lead one to strike out blindly against his own family (1 Sam. 20:33), contributing to its breakdown and destruction. Not only can such a mindset affect an individual, it can permeate a family. Thus all those who follow in Saul’s footsteps—Abner, Ish-bosheth, Michal, Shimei, and other descendants of Saul—meet a similar fate. Saul’s obsession to destroy David leads to the destruction of many in his family, not to mention the political chaos and destruction that accompanies it. How true it is that the one consumed with hatred ends up destroying him or herself as well as the ones he or she loves. Hatred and bitterness will destroy a family (and a nation); but just because a family becomes consumed with animosity does not mean that every member must conform. The books of Samuel continually affirm our freedom to choose. No matter what the circumstances in which we find ourselves, our attitude and response are still our choice. While Samuel has godly parents and follows the Lord, and David’s sons have a godly father but do not follow the Lord, Jonathan stands alone in these books as a godly son with an ungodly father. Ungodly parents are no excuse for children to continue down the same path. Each must make his or her own choice. Jonathan is an example to all that the cycle of ungodliness can be broken. This beautiful example, followed by his son Mephibosheth, is the silver lining in a family clouded with self-assertion and pride. While it is true that Jonathan’s loyalty leads him to die beside his father, his humility and selflessness point the way to a future for Saul’s family. Jonathan’s love and devotion to David turn the family’s fortunes from a path of hatred and death to one of life and hope. Jonathan’s example points the way for us as well. Unlike King Saul, America has a tradition of the peaceful transfer of power. Although I certainly have strong political opinions like most Americans regarding the recent election, my aim here is to note some of the principles enunciated above. These biblical principles can help guide our response to, not only this election, but future behavior. Don’t judge a book by it’s cover. Saul looked good for the nation but turned out to be a disaster. The lesson of not being deceived by first impressions is an important message in 1&2 Samuel (I have written about it elsewhere on this blog. See HERE). Just because someone “looks good,” doesn’t mean they are. Conversely, sometimes people who make unfavorable impressions can surprise us. Admittedly, neither candidate in this recent election made a good impression. It was frequently stated that no matter which candidate won the presidency, they would go down in history as the most unpopular president ever elected. Now that the election is over, I suggest that we not jump to conclusions, but allow our judgment on the future president to be based on his performance. Does he keep his campaign promises? Does he treat others fairly? Does he seek justice? Does he promote the welfare of the country? Only the days ahead can give us clear answers to these questions. There are two reactions to losing power. One reaction is the Saul reaction–cling to power no matter what the cost. Even with a divine word to the contrary, Saul held tenaciously to power. The result was violence against individuals (David) and families (the high-priestly family), and eventual civil war among the nation. One of America’s great traditions is the peaceful transfer of power. We were reminded of this the day after the election in President Barak Obama’s speech congratulating President-elect Trump on his victory (if you haven’t seen it or need a reminder, click HERE). 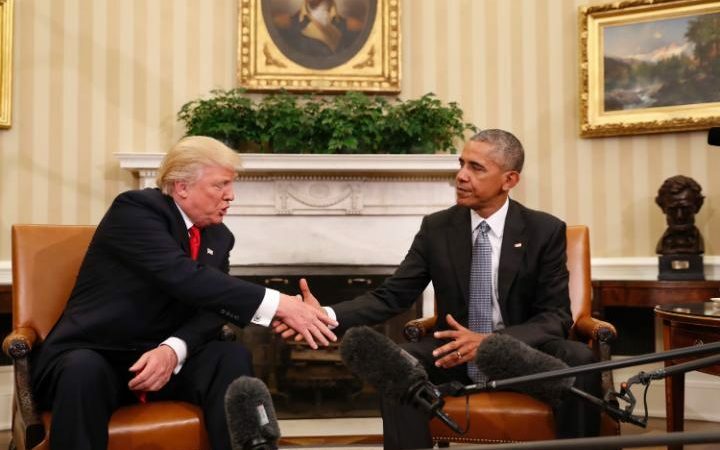 This peaceful transfer of power was further symbolized by President Obama’s invitation to Donald Trump to visit him at the White House the following day. For those who believe Scripture, we know that God puts kings (or leaders) in positions of power (e.g., Daniel 4:17). The books of Samuel clearly announce this at the outset in the prayer of Hannah in 1 Samuel 2:6-8. A peaceful transfer of power is best for all. It is far superior to Saul’s way, and it recognizes that a Greater Power has ordained the earthly powers. America would do well to continue this tradition. Corrupt government harms a nation (I know how obvious this statement is, but you wouldn’t know it was obvious by the way most governments are run!). Saul is pictured as a leader who begins humbly and achieves a certain amount of success (1 Sam. 11). However, as Saul becomes more self-consumed his actions and policies prove detrimental to the nation of Israel. No human government is perfect, this is why Christians look forward to the rule of Christ. However, leaders should strive for “justice for all” as the America pledge of allegiance puts it. In fact, it is likely this American slogan is derived from biblical statements about the just king (e.g., 2 Sam. 8:15; Ps. 72). We need more Jonathan’s! Jonathan wasn’t worried about “what he deserved.” His humble approach was more about what was best for the nation. He was content with the position God had placed him in. His concern wasn’t winning or losing, but seeing justice and righteousness prevail. Americans would do well to follow this example and relinquish the “entitlement mentality.” As John Kennedy once said, “Ask not what your country can do for you, ask what you can do for your country.” As a Christian, it goes beyond even this, asking ourselves how we can reflect God in our attitudes and actions. Beware of hateful intentions, words, and actions. Saul’s hateful response to those around him destroyed his family and caused havoc and destruction within the nation. Ironically, Saul struck out in hatred even toward those who were on his side! David was a loyal follower but became public enemy number one. 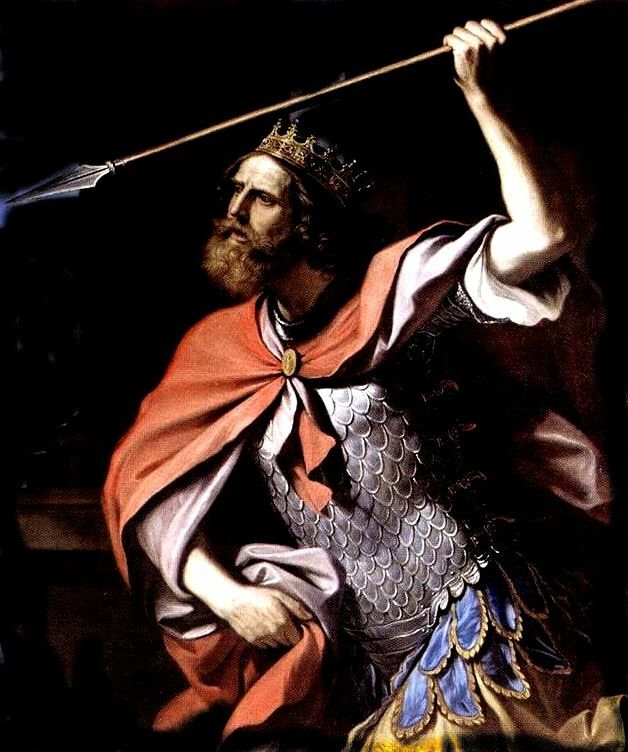 Saul even threw a spear at his own son because Jonathan refused to condemn an innocent David (1 Sam. 20:32-33). All of this is evidence that hatred blinds people to the truth. Hatred destroys all in its path. If our nation is to survive, then we must be a nation that puts hatred behind us, seeking reconciliation and peace. Consider Purchasing Family Portraits as a Gift This Christmas. Available at WestBow Press, Amazon USA / UK and various other internet outlets. Previous PostThe Structure of RomansNext PostOldest Hebrew Writing Discovered From Egypt? Hello. I came by your site while searching for violence in the old testament. I must admit that while reading the old testament, my faith has been shaken to the core. I have become scared of God. Are there any books or any advice (or both) that you may can give. I desperately want to return to the warmth of Christ instead of the fear. My mind is one that won’t stop until I have satisfied the questions I have. I know this is random and out of no where, but any help you can give would be great. Thank you. I apologize for not writing sooner. I don’t know if you’ve looked at my series on violence in the Old Testament (there are 12 posts associated with it). If you haven’t seen these posts I would recommend reading through them. The series is listed at the top of my blog and also on the left-hand side under “categories” (underneath a copy of my book). Another source that would be worth checking out is, “Is God a Moral Monster? Making Sense of the Old Testament God.” (Here is the link on Amazon. http://amzn.to/2gL5fVM) I have not personally read this book but I have read articles by Copan and I have found them helpful. I would encourage you to keep reading. This is certainly a difficult subject, but there are also good explanations. Sometimes as 21st century readers we misread the Old Testament. Context and understanding ancient culture are 2 important ingredients. God bless and let me know if I can be of further help.